8 Commercial Real Estate & Properties in Upper Coomera are listed in 4 categories. We have 3 Industrial Warehouses Sale , 3 Development LandsSale , 1 Hotels and LeisureSale and 1 Retail ShopsSale . 145m² Concrete tilt panel warehouse Small front office / reception area Sealed floors and insulated roof 3 phase power with electric roller door Shower, toilet kitchenette Exclusive car parks Call agent today for more details! Approximately Disclaimer: Ray White has not independently checked any of the information we merely pass on. We make no comment on and give no warranty as to the accuracy of the information contained in this document which does not constitute all or any part of any offer or contract by the recipient. Prospective purchasers / lessees must rely on their own enquiries and should satisfy themselves as to the truth or accuracy of all information given by their own inspections, searches, inquiries, advices or as is otherwise necessary. No duty of care is assumed by Orchid Avenue Realty trading as Ray White Surfers Paradise Commercial divisions toward the recipient with regard to the use of this information and all information given is given without responsibility. Excellent commercial land opportunity Huge exposure to M1 Motorway and future off ramp Surrounded by rapidly expanding residential pockets Sizes ranging from 1,457m2 3,180m2 Ready for construction STCA Suitable for a variety of uses. approx. For further information, please contact the Exclusive Agent by clicking on the above link. Disclaimer: Ray White has not independently checked any of the information we merely pass on. We make no comment on and give no warranty as to the accuracy of the information contained in the email which does not constitute all or any part of any offer or contract by the recipient. Prospective purchasers / lessees must rely on their own enquiries and should satisfy themselves as to the truth or accuracy of all information given by their own inspections, searches, inquiries, advices or as is otherwise necessary. No duty of care is assumed by Orchid Avenue Realty trading as Ray White Surfers Paradise Commercial divisions toward the recipient with regard to the use of this information and all information given is given without responsibility. If you receive this email in error, please advise us immediately. If you are not the intended recipient of this message, you are notified that you must not disseminate, save, forward, disclose, copy or use this information. 4 Dalton Street Upper Coomera is located along the M1 Motorway in the Northern Gold Coast growth Corridor. The property is located approximately 1km from the newly upgraded Exit 54 at Coomera while the rear of the property presents excellent exposure to the M1 Motorway. The property presents a rare opportunity for owner occupier's developers and land bankers to secure one the last remaining sites on the M1 Motorway with development potential. The property features: Approximately 15,600sqm of usable land 22,400sqm of total land area Approximately 140m frontage to M1 Motorway Zoned low impact industry Approximately 1km from the M1 Motorway Walking distance to Woolworths, Coles and the Coomera Square shopping precinct Approximately 3km to Coomera Train Station 2.4km from Dreamworld Please contact CBRE for further information and information memorandum. 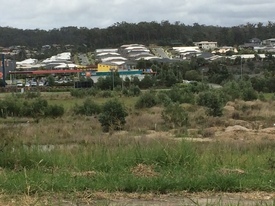 Opportunity knocks once Industrial land in Upper Coomera 11.46ha for development 42 lots lapsed approval (relodged) Blocks ranging from 1,002m2 to 3,632m2 4 lots fronting the proposed overpass to the Coomera Town Centre Walking distance to local shopping facilities Developers note: demand for land is high in this area approx Please contact the listing agent for more details by clicking on the link above. Disclaimer: Ray White has not independently checked any of the information we merely pass on. We make no comment on and give no warranty as to the accuracy of the information contained in this document which does not constitute all or any part of any offer or contract by the recipient. Prospective purchasers / lessees must rely on their own enquiries and should satisfy themselves as to the truth or accuracy of all information given by their own inspections, searches, inquiries, advices or as is otherwise necessary. No duty of care is assumed by Orchid Avenue Realty trading as Ray White Surfers Paradise Commercial divisions toward the recipient with regard to the use of this information and all information given is given without responsibility.